Laws, rules and models used by the world's most successful companies to optimise their marketing. Why do people choose to buy products that are more expensive? Why do others buy cheap and nasty? What is it that people are actually buying? The physical product? The service? By conducting a product analysis you can discover new insight into your business and your industry. Truly objective product analysis can open minds to new product development and brand management concepts, opportunities and courses of action your firm may never before have considered. In understanding the buyer decision making process, selection of communication strategy becomes a crystal clear process. Advertising and integrated marketing communications MUST be matched to your buyer readiness stages. Your target audience needs to be AWARE of your product before they can possibly develop an INTEREST, DESIRE and consequent DECISION TO BUY. Your marketing communications must be "in sync" with your target audience, or your marketing communications, no matter how good, will be inefficient or simply will not work in increasing your sales. Michael Porter is one of the heroes of 20th century marketing theory. The 5-forces model is used to evaluate industry attractiveness. Essentially, more attractive industries share these five traits. Of course, other issues apply, but in essence, this model is great for determining whether or not "the grass is greener on the other side of the hill". 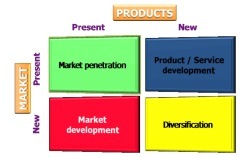 Ansoff Analysis allows management to focus marketing and management direction. Different strategic initiatives exist for each quadrant, so once the objective is identified the strategies and issues immediately become evident..
What are the obstacles? What level of investment is likely? What is the likely learning curve? Are we using existing or new channels, abilities, knowledge? Developed by Trout & Reiss in the early 1990's. The Immutable Laws of Marketing offer profound guidelines for management and planning marketing strategies. Very poignant for c-level executives and strategic and marketing governance decision-making. The most powerful tool in the marketing manager's arsenal is segmentation. The STP process ensures business stay on target and their marketing maintains optimal efficiency. Once you apply STP scientifically, you begin to produce "Pearl after "Pearl", and leave your competitors to sell their Dinosaurs, develop their Ostriches and play with their Flamingos. Is your Marketing Planning Utilising Advanced Marketing Science? If you have read this far, you probably genuinely appreciate that there is advantage to be had in applying academically and commercially proven Marketing Science. To "see how deep the hole goes", just email us by clicking this button, or fill out this form and a consultant will get back to you ASAP. Remember, "Procrastination is the thief of time" and the sooner you act, the sooner you'll enjoy the benefits! The relative importance of different types of promotion in B2B Marketing: This graphic compares marketing promotions importance in B2B scenarios compared to B2C scenarios. NB: Subject to other marketing models. Components of Brand Equity for Brand Management: The meaning of brand and the items that contribute to brand equity. Factors influencing Consumer Behaviour: For B2C marketers, also see Types of Business Buying Behaviour, Product Type, and more on Buyer Readiness. Customer Value Management: ACER model: Increase profits by 20%+ without increasing your number of transactions?. The Law of Diminishing Brand Loyalty: Brand equity is your biggest asset... but if your brand equity is failing, you CAN use that to your advantage. Approaches to Market Segmentation: What is the best way to segment a market? Knowing that any market place is simply a corral for market segments is the most concept in marketing management. The Hierarchies of Marketing: The 'hues', and varying skill sets, of marketing personnel.. The Nexus of Marketing: The multiple and complex disciplines that form the basis of strategic marketing management. The 8 "P's" of Marketing: The 8 Components that form a realistic, commercial marketing mix. 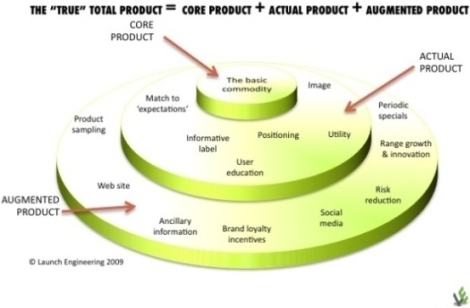 The New Product Development Wheel: A new product development model that helps develop products with commercial validity and minimal chance of failure. New Product Launch Pre-launch checker: This tool quantifies the chance of your product launching succeeding. It takes your input, applies researched values to your responses and predicts the likelihood of launch success, identifying what you have to do to improve your chances of success. Pricing Strategy Models: A few important models and concepts in Pricing Strategy. 9 Components of Product Launch Success: Helps businesses when planning to launch a new product. Free Stuff for DIYers: Marketing is not a DIY activity, but if you're adamant, here's are a few helpful giveaways you might find handy.